Published: Feb. 3, 2019 at 08:44 p.m. 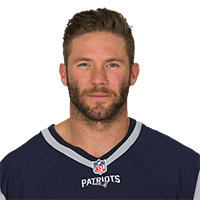 Published: Jan. 13, 2019 at 03:44 p.m.
New England Patriots quarterback Tom Brady finds wide receiver Julian Edelman for a 35-yard gain. Published: Dec. 30, 2018 at 03:58 p.m.
New England Patriots quarterback Tom Brady tosses 4th TD pass of the day to wide receiver Julian Edelman for a 5-yard TD. Published: Dec. 23, 2018 at 09:17 p.m.
New England Patriots wide receiver Julian Edelman catches a pass and rolls over a defender, but his knee does not hit the ground and he scampers in for a touchdown.